Wang Huaizhong, former vice-governor of east China's Anhui Province, was executed Thursday morning in Jinan after losing an appeal for lighter penalty in January at the Shandong Provincial Higher People's Court. He was put to death by lethal injection at the approval of the Supreme People's Court and was allowed to meet his family before the execution. Wang, 57, was sentenced to death in December 2003 by the Intermediate People's Court of Jinan, capital of the eastern Shandong Province for taking bribes valued 5.17 million yuan (US$623,000) from 1994 to 2001 and possessing 4.8 million yuan that he could not account for. He was also deprived of political rights and the court ordered confiscation of all his properties. The former official was detained and investigated in September 2002 by the Supreme People's Procuratorate for suspicion of taking bribes, and was arrested in October the same year. His case was handled by the People's Procuratorate of Shandong Province, to ensure impartiality of investigation. Instead of confessing to his crimes, Wang had stood against the public prosecutors and even continued to seek bribes during the investigation from some private business owners, said Wang Huanhai, head of the investigation team. According to the prosecutor, Wang attempted to use the bribe to buy over more relations, hoping the Central Commission for Discipline Inspection of the Chinese Communist Party would spare him from being inquisited. During the first trial on Dec. 29, 2003, Wang denied all the allegations, but in the latest trial confessed to most of the crimes and argued for a light penalty on the grounds that the bribes he had taken were not big enough to justify a death penalty. His request was turned down, given the amount involved in the case as well as his resistance to investigation. Wang's prosecutors said he was an orphan and had climbed up the social ladder with an inferiority complex. "That's why he was dictatorial and could not stand anyone questioning him," said Wang Huanhai, "Nor did he ever confess to his wrongdoing in public." 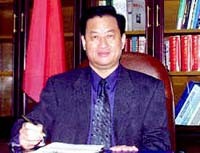 Wang became vice-governor of Anhui Province in 1999. Before that, he was secretary of the municipal committee of the Communist Party of China in Fuyang City of Anhui. What do you think Western view about China?